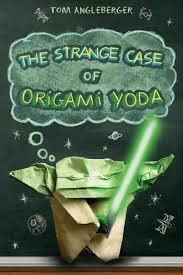 A book party celebrating Tom Angleberger’s “Origami Yoda” series would be good for any library at any time of year. Set-up several crafts and games in your meeting room or library patio, with at least two high school volunteers at each station. Be sure to have water and fruit slices (watermelon and oranges) available for a snack, especially if it is a warm day. Brown, Jeffrey. Darth Vader and Son. Chronicle Books, 2012. Brown, Jeffrey. Goodnight Darth Vader. Chronicle Books, 2014. Brown, Jeffrey. Vader’s Little Princess. Chronicle Books, 2013. Display: Offer some of the read-alikes of the “Origami Yoda” series suggested in our Read-Alikes section. Make Star Wars Rock Buddies or other crafts seen here: www.pinterest.com/discoveryed/denbrarian-october-2013-strange-case-of-origami-yo/ . Set up an online gaming area, using the free online games at the official “Star Wars” website: www.starwars.com/games-apps . Destroy Darth Vader: Print out pictures of Darth Vader, Boba Fett, or other villains, and tape to large empty two-liter soda bottles that contain approximately one inch of sand. The sand will help weigh the bottles down. Give player three bean bags, and see if player can knock over one of the bottles to win a prize. Pin the Light Saber on Yoda: Like “Pin the Tail on the Donkey,” this has wide age appeal. Print out a large picture of Yoda. Make simple construction paper light sabers for each player. Let each blindfolded player tape their light saber onto Yoda – the winner is the one who gets the saber closest to Yoda’s hand. Feed Jabba the Hut: Make a stand-up cardboard figure of Jabba the Hut, with a hole where his mouth should be. Give player three bean bags; if player can get a bean bag into Jabba’s mouth, he or she wins a prize. Give out small consolation prizes at all games.